Dr. Pascual is making her vision a reality. In the past seven months, Operation Blessing remained in Leyte, Eastern and Western Samar, Northern Cebu, and Panay Island to oversee its long-term rehabilitation and reconstruction efforts. As the initial phase of bringing relief goods to the survivors ended, Operation Blessing turned its attention to the rebuilding of damaged communities. Operation Blessing calls this program, “Communities of Hope.” One of these communities is being built in Barangay Sto. Niño, Tacloban, Leyte, where a total of 60 houses were turned-over to its beneficiaries on July 22, 2014. These homes would not be built without the help of other organizations who shared the same vision with Operation Blessing. All Hands Volunteers, a United States-based non-profit organization that brings volunteers to disaster-affected areas, were among the groups who helped build the shelters together with the beneficiaries themselves. The local government unit (LGU) of Tacloban was also very supportive in facilitating the security of lots used as well as during the construction of the houses for their constituents. 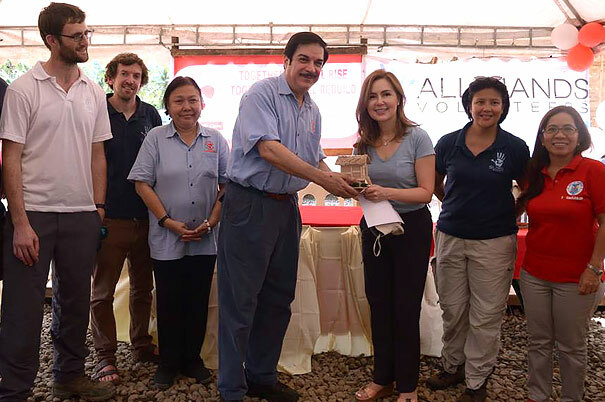 Joining the turnover ceremony are Tacloban City Counselor Cristina Romualdez (3rd from right), CBN Asia and Operation Blessing Foundation Philippines President and Chief Executive Officer, Peter M. Kairuz (4th from left); Dr. Kim April C. Pascual (3rd from left) and All Hands Country Director Nimfa Bito (2nd from right). Aside from building homes for the survivors, Operation Blessing also invests in the next generation by rebuilding and repairing schools damaged by the super typhoon. Operation Blessing was able to rebuild schools in Basey, Western Samar and Guiuan, Eastern Samar, and repaired schools and health centers in Tacloban and other areas of the Visayas. To date, 732,283 survivors of Super Typhoon Yolanda were reached by the continuous efforts of Operation Blessing Foundation Philippines to transform lives, one community at a time. Call or text these numbers for more information on how to help in the ongoing disaster rehabilitation operations of Operation Blessing Foundation Philippines: (+632) 477-7806/ 0920-4975558/ 0922-8036922/ 0917-5812603. For regular updates, LIKE and SHARE our Facebook page, Operation Blessing Foundation Philippines, or follow us on Twitter, @obphil.